For summer 2019 the Department of Civil, Construction, and Environmental Engineering (CCEE) is looking to expand the UNM-GEO (Global Education Office) study abroad program to include not only students from CCEE but also the UNM School of Engineering, Mechanical Engineering, Architecture, Water Resources, and the Honors College. The courses will be delivered in two 2-week blocks in June 2018 in Germany and Holland, respectively. The programmatic goal is to introduce students to the principles and practices of resilient infrastructure design through historical and contemporary projects in Europe. Germany and Holland provide ideal environments to investigate this theme as illustrated through their ability to overcome human and natural disasters including the world wars, magnificent sea storms, and climate change. The first course, in Germany, will focus on transportation systems and the country’s processes for recovery and reunification. The second course, in Holland, will focus on the Dutch experience in working with and against nature in the process of developing one of the world’s most prosperous countries – largely below sea level. 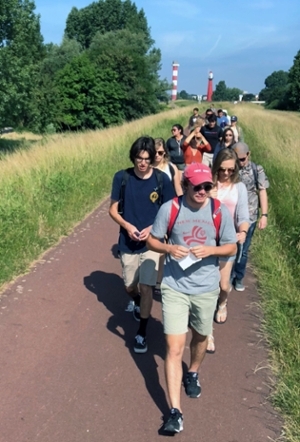 Both courses will blend site visits, lectures, reading, and writing activities to expose students to the philosophies, processes, and specific techniques used in Germany and Holland to develop resilient communities. An emphasis will be placed on comparing and contrasting the German, Dutch, and American experiences and approaches to infrastructure design. Elements of local culture, language, and academic environments will also be weaved through the program. To learn more about this program, and to apply, please visit UNM's Global Education Office website.